"The village of Sayan stretched along the top of a narrow ridge that ran up into the mountains. Every three days a crowded bus rattled down from the Chinese coffee plantations to den Pasar, choking and stalling as it climbed back again at night. The land I wanted lay at the end of the village, next to the graveyard, on the edge of a deep ravine. Far below ran the river; across the valley rice fields rose in terraces and disappeared in the coconut groves. Behind these ran the mountains of Tabanan, and far off to the south a triangle of sea shone between the hills. The land had once been terraced to grow rice, but now was covered with grass and shaded with coconuts. It descended in several steps to the edge of the cliff, where it dropped four hundred feet. From below came the faint roar of the river as it rushed among the rocks and stones." Villa Ria Sayan is nestled into the natural hillside amongst fruit trees, tropical plants and flowers. 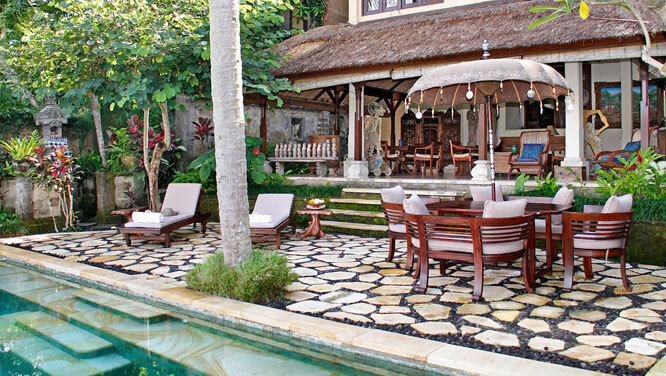 The villa is furnished with Indonesian antique furniture and artifacts, hand woven textiles and local Balinese crafts. Enjoy the privacy, character, and personal comfort of a private home with the amenities, guest services and high standards of a luxury hotel. We are staying here in March for 2 nights. We have wonderful time here. It's a lovely place. Love and peace we found. We are grateful to be here. We were in Bali many time but this time are special. We feel like home far away from home. We love it here. We had the most lovely time here at the Villa Ria Sayan! Staff is very helpful and professional the location is magical and we loved the temple music and frog/gecko chorus every night. Thank you!